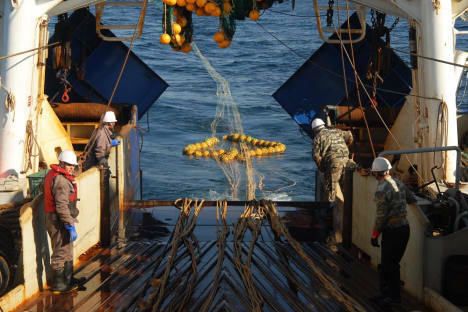 One of the most intense moments in modern commercial fishing is when the cod end (the end part of the trawl) appears on the sea surface pulled up by ropes. Both the sailors aboard the ship and the seagulls hovering over it are waiting for the catch. The cod end looks like an ornate Chinese dragon. Streams of seawater flow along the orange fringes of a cod end that has just been pulled out and down to the ship deck. The final part of fishing begins when the “dragon” is lifted high above the deck, the rear part is hooked with the hoisting rope, and Alaska pollock flow into the open hatch of the ship’s upper deck in a smooth stream. The amount is always unpredictable. Sailors say that sometimes a fully loaded 50-ton cod end jumps up from the waves; sometimes it even bursts because of the weight of the fish. But some days the catch is scarce. Pulling up near the active volcano Atsonupuri, on Iturup Island in the Greater Kuril Ridge and hauling up the cod end, it appears that for the fishing boat Taivaniya, the third day of a recent voyage is one of those days. Only eight tons of Alaska pollock are brought to the deck. The earnings of the crew directly depend on the volume of fish in the cod end. An Alaska pollock up to about a foot long costs about 1 rubles (about three cents) per pound, one longer than that is 1.25. Prices are standard and the level of inflation has no influence upon the earnings. Deep-sea Alaska pollock is caught with the help of modern electronic devices and trawls examining sea depths and undercurrents. Alaska Pollock generally live in depths up to 1,640 feet. The Taivaniya was built in Canada specifically for coastal fishing. At Shikotan, the largest of the Kuril Islands, there are only two ships that fish for Alaska Pollock, which is caught year-round, day or night – the Kapitan Lapkin and the Taivaniya. With the dissolution of the Soviet Union, fishing boats passed into private ownership. As a result, the number of fishing boats in the Russian Far East has dropped considerably. Up to 150 ships may have trawled these waters in the past, but today they number fewer than 20. Nevertheless, the income from fishing has not increased. According to the fishermen, if in the past it was possible to spend six months at sea and the other six at home, today they have to spend eight months a year on the water. The morning of the poor catch, the Taviniya was in waters at a depth of about 1,200 feet. The water temperature at that depth is just above freezing. The warmer the water is, the later Alaska pollock “matures” and the later it spawns. At a fish processing plant on Shikotan, Alaska pollock roe is frozen and then exported. The three strongest sailors work in the freezing compartment at the lower level of the ship. There the temperature is permanently below zero. All the fish are packed into plastic boxes weighing 50 kilograms each and are transported to the hold by a conveyor. Alaska pollock covered with artificial snow may be kept for several days. The optimal load for the ship is 120 tons of fresh fish. All the Alaska pollock that is pulled out in the cod end will pass through the three pairs of these men’s hands. One of the sailors, Alexander, said that he was warned about the work in the refrigerator before he joined the crew, but that a common sailor has no right to choose his position on the ship. He only has the right to refuse the job entirely. Otherwise he goes where he is needed, and everyone on board works for the common good.